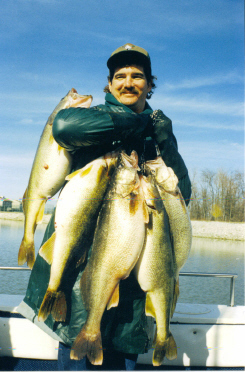 "Lake Erie Walleye Fishing at it's BEST! 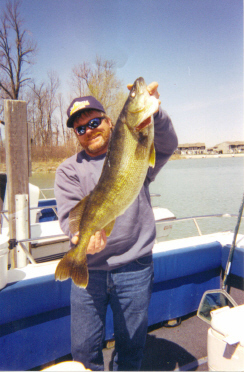 Sport fishing on Lake Erie for walleye near Port Clinton, Ohio"
Lake Erie's #1 Charter Boat Service serving Port Clinton & the Western Basin for over 35 years. We are not only the most popular charter boat service, we continue to also be #1 in customer satisfaction year after year!!! Do you remember the good old days of the late 70's and early 80's? It was a time period when you could cast almost any lure in the water and catch walleye. Here we go again! We have had 2 of the best walleye hatches ever in the last 5 years according to the ODNR. The 2018 walleye hatch looks to be the 2nd best ever. ODNR's 2018 August trawl survey found 112 walleye per hectare. Compare that to the 20 year average of 27 per hectare. The 2015 hatch is considered to be #5 best all time. We expect to see lots of 18 to 20 inch walleye (good eaters) this year. Lake Erie still has plenty trophy walleye lurking around the reefs and islands as always. No question about it Lake Erie's "good old days" are NOW. 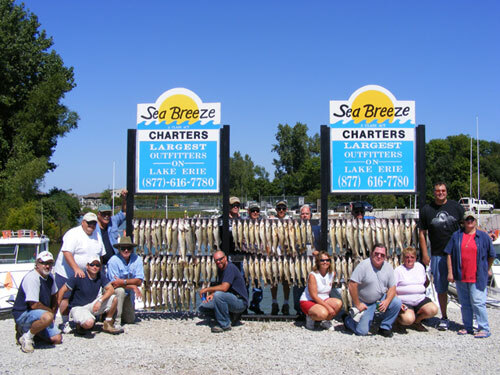 Sea Breeze Charters of Lake Erie for spring walleye. Our Lake Erie fishing charters have been delighting fishermen with lifelong memories for over 35 years on Lake Erie. Our charter boats are located at Wild Wing's Marina, just west of Port Clinton, Ohio. This marina is a direct access marina, meaning you will spend less time boating and more time fishing Lake Erie. We believe our marina has a better location for nearly immediate access to the walleye reefs than walleye charters running out of Port Clinton. Port Clinton charters come out of the Portage River area then need to head northwest several miles to reach the walleye fishing reefs of the western basin of Lake Erie. Our marina is just a short boat ride south of these reefs which are teaming with schools of walleye for several months every fishing season. By the time the walleye begin migrating toward the Port Clinton Portage River access area of Lake Erie, the walleye fishing season is drawing to a close. We have always believed our marina's location is a much better location to charter from providing the very best walleye fishing experience for our customers with the very least amount of boat ride. After all you chartered a fishing trip not a boat ride! Walleye fishing begins just after the ice melts and the winter temperatures begin to fade. Mid March begins the hunt for the trophy walleye of your dreams. Fall walleye fishing starts in late August and is not to be overlooked either as it produces some of the largest catches of the year. Smallmouth bass are a tenacious fighting fish. If you desire to mount a trophy bass on your wall or fry it in a pan, the western basin has some of the very best bass angling North America has to offer. May to late fall is the prime time for these deep diving, tail walking beauties. 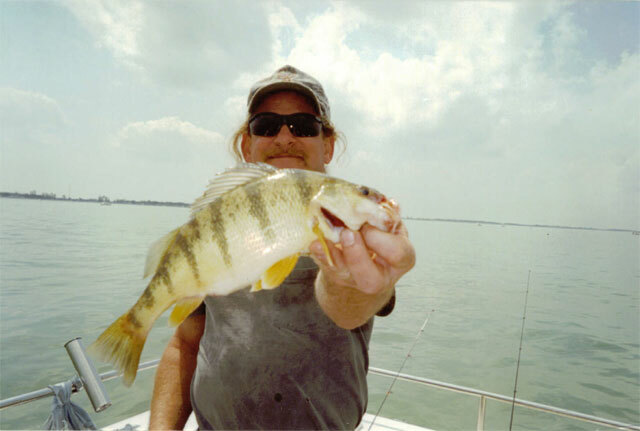 Lake Erie yellow perch are considered by many to be the best eating fish in the Great Lakes. They are schooled up by early August. We catch perch until we pull the boats out in early November. Fall perch charters are a great time to get the kids hooked on fishing and it's also the perfect time to stock up on fillets for that long cold winter ahead! Our clean, comfortable lodging is within walking distance to the boat, restaurant, bar, convenient store, and fish cleaning. Our fishing charter and lodging packages start at $100 per person. Bait and tackle is included on ALL of our trips. We also offer an executive package which includes food, beverages, and fish cleaning. Sea Breeze has the perfect package to suit any budget. LIMIT POLICY: It is our policy when you have caught your limit of walleye (any other species also) is not to bring you back to dockside prematurely, if you limit out in a couple of hours (which frequently occurs). We utilize the remaining portion of your trip to fish for another species or just catch and release walleyes. Our staff has over 500 years of combined experience. Our fishing guides are full-time fisherman and have lifelong experience navigating the waters of Lake Erie. Researching Lake Erie Fishing Charters? we have provided a list below of our competitors to help you with your Lake Erie Charters research!! Wallhanger Charters - Lake Erie charters offers some of the most exciting and successful walleye fishing available. Mega Bites Charters - thousands of anglers from all over the country travel to Northern Ohio annually to experience a Lake Erie charter. Lake Erie Fishing Charters - Lake Erie is a big lake and finding the right area to fish is a process that starts before and continues during the charter.